On GiochiMahjong.it you can play online Mahjong Solitaire games and different variations on Mahjong Solitaire. Read all about the rules and background of this classic tile matching game on this page. Mahjong Solitaire is a solitaire game that uses mahjong tiles. This game is also know as Mahjongg Solitaire, Shanghai or simply as Mahjongg or Mahjong. The tiles are derived from the four player Chinese game Mahjong. 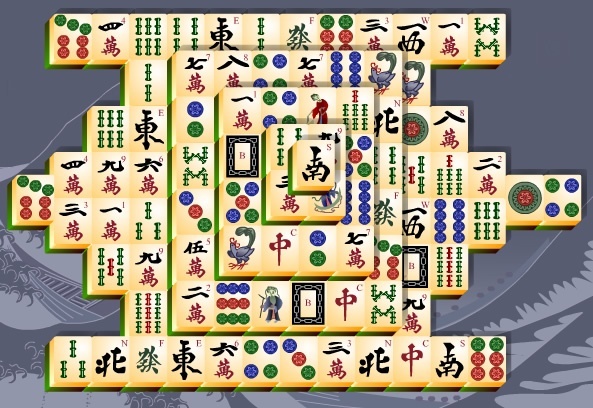 The traditional tiles are based on Chinese characters and symbols, but modern Mahjong Solitaire games can have all kinds of different images on the tiles. In Mahjong Solitaire tiles are arranged in different layouts and shapes with their faces up. The goal is to combine two of the same tiles and to remove them from the layout. Only free tiles can be combined. A tile is free if it can be moved either left or right without disturbing other tiles. In some games you can combine a flower tile with any other flower tile and the same applies to season tiles. There are different variations and other solitaire games with mahjong tiles. On GiochiMahjong.it we offer Mahjong Connect, 3D Mahjong, Mahjong Games and Mahjong Tower Games. Mahjong Connect is also known as Mahjong Chain, Mahjong Link, Kyodai, Shisen-Sho or Four Rivers. This is another Solitaire game with Mahjong tiles. The goals is to match two of the same tiles until all tiles are removed, but in this game you need to connect the tiles by up up to three horizontal or vertical lines which pass only through empty spaces. 3D Mahjong or Mahjong Dimensions is a 3D mahjong solitaire game where cubes form a 3D structure. The goal is to match two of the same free cubes until all cubes are removed. In this game a cube can be matched if it has at least two adjacent free sides. Usually you can rotate your view to inspect cubes at the other side of the 3D layout. A Tower Mahjong Solitaire game is like Mahjong Solitaire but in this game tiles usually are stacked in many layers creating a Tower. The same rules apply. Combine two of the same free tiles and clear the tower from the board. Many and many different variations of Mahjong Solitaire games are possible and can be found on GiochiMahjong.it. Games with different shaped tiles like triangle or hexagonal tiles. Games where you have to match three instead of two tiles, games where you have to slide two of the same tiles next to each other and games where you have to combine black and white tiles. Discover and enjoy all. Zygomatic is an online publisher since 2003. Our focus is website publishing and online game development and publishing. Since 2003 Zygomatic publishes and develops internet sites in two areas. We have a lot of sites regarding online photo editing and we also have a strong portfolio in games sites in several languages. The games sites are usually aimed at bigger game niches like Mahjong games and Solitaire games. Most sites are available in Dutch, English, German and Spanish. Zygomatic also develops, licenses and distributes its own online games (HTML5). Zygomatic is the biggest developer for HTML5 games worldwide and develops two new games per week in different languages: German, Russian, Chinese, Spanish, Portuguese, French, Dutch and English (more info). The games are also used as marketing tool for our games portals. Contact us via email at info[at]zygomatic.nl, or use the contact form.